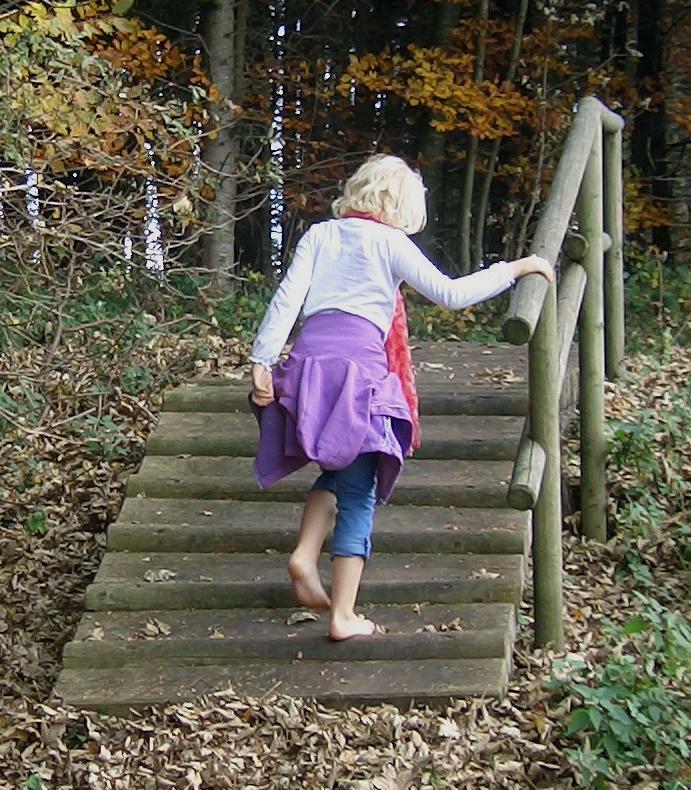 Barefoot trails, barefoot walks or barefoot parks -- different names for essentially the same thing -- give millions of visitors each year the opportunity to enjoy barefoot life. During the last two decades, an estimated hundred of these destinations have been founded in European countries, mainly in Germany and Austria. 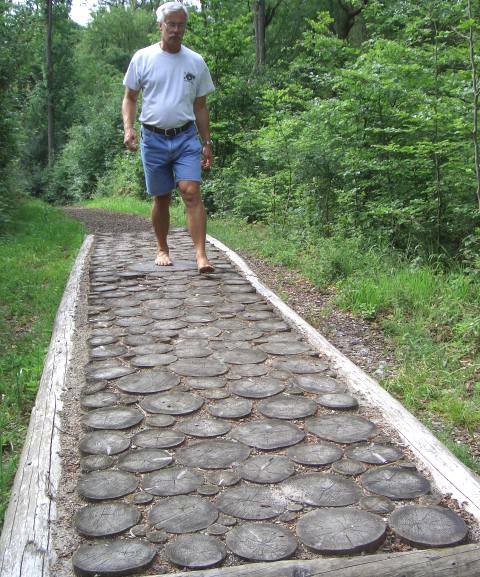 They are open to the public and offer the opportunity to walk barefoot for some distance (up to three miles) and to feel natural ground and various materials with bare soles. At the beginning of each hike, shoes can be stored on shelves or in lockers, and at the conclusion, facilities for washing feet are provided. 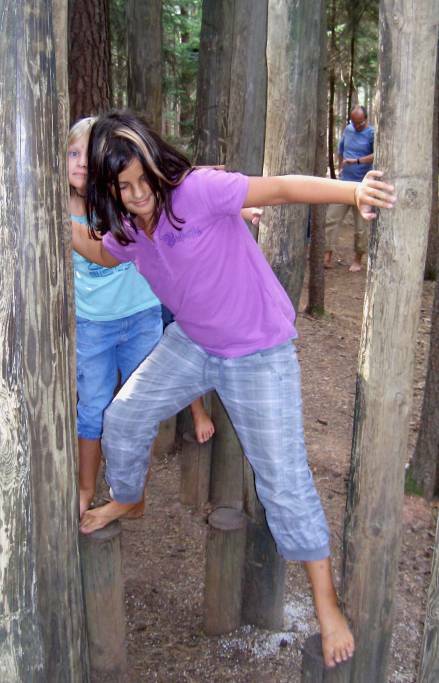 In addition, visitors can enjoy balancing or climbing and walking through brooks or even rivers. 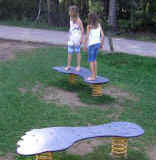 Some barefoot parks include playground sections designed for bare feet. 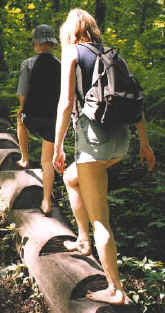 These healthy combinations of barefoot hiking and playing have become popular tourist attractions. 2 km barefoot trail containing 22 stations with different soil conditions. A veritable barefooting theme park in an amazing mountain landscape situated at the middle station of the cable car. It contains spacious water playgrounds, 2 km barefoot trail, sightseeing, restaurants -- bare feet admitted everywhere! Many families enjoy it for a whole day. 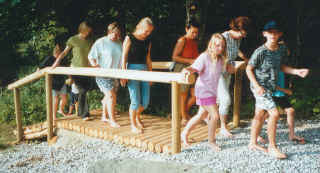 A spa garden, in which visitors can go barefoot on lawn and a variety of materials and surfaces, as well as water wading and balancing. 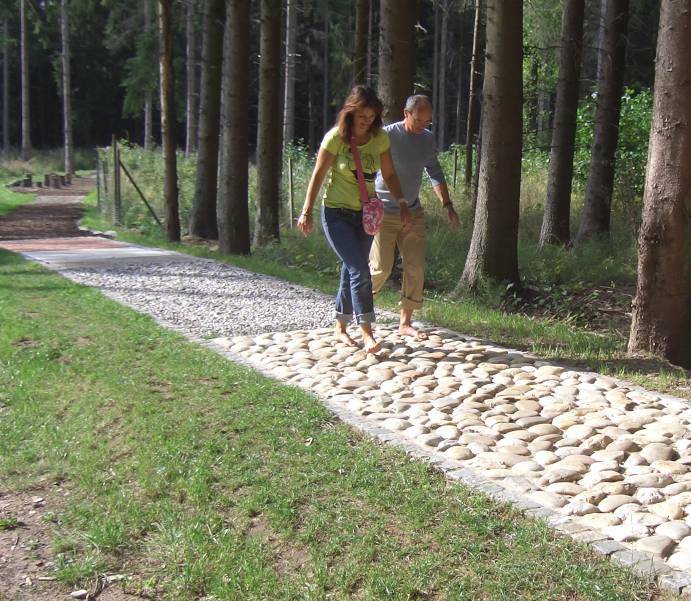 A 1,2 km barefoot trail in a forest area with different materials, stations for natural experience, balancing and related abilities. 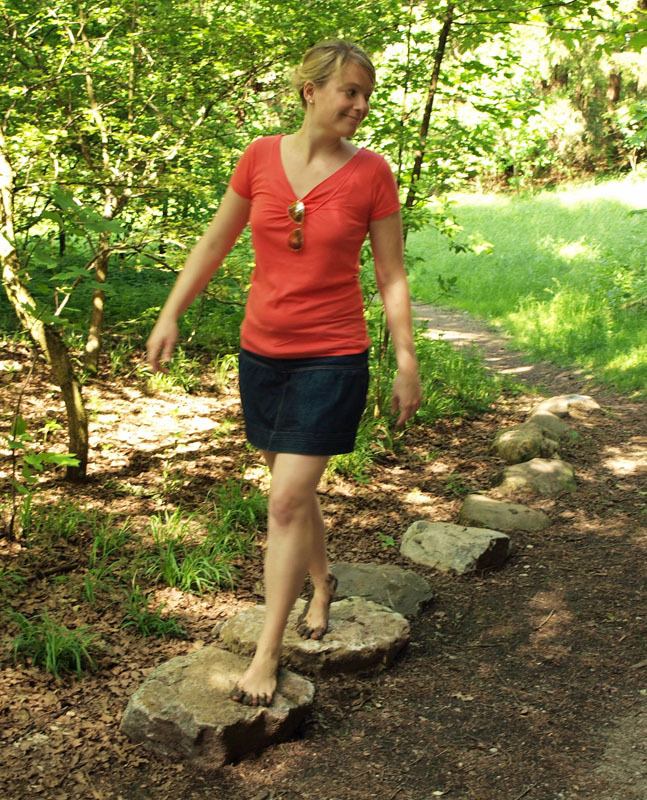 A 1 km barefoot walk with 45 different textures and materials in a beautiful garden area. 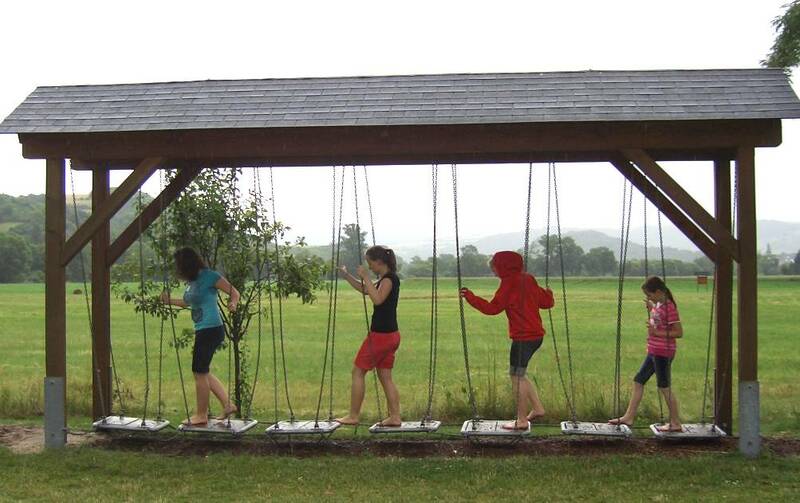 A 2.5 km barefoot walk through forest and meadow, water wading, spacious water playground. Every week, thousands of visitors enjoy natural walking on an exceptional variety of grounds. 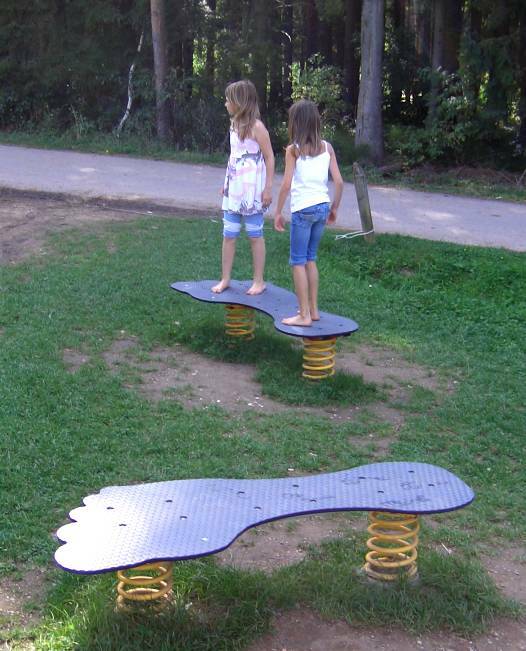 This park comprises 2.1 km barefoot trail with a variety of soil materials as well as stations for visual, hearing and smelling experience. 1.2 km in beautiful landscape with stations for feeling materials, balancing, water wading, restaurant with playground. 1.9 km barefoot hiking in a forest area, walking on various materials, balancing and relaxing at different nice places. 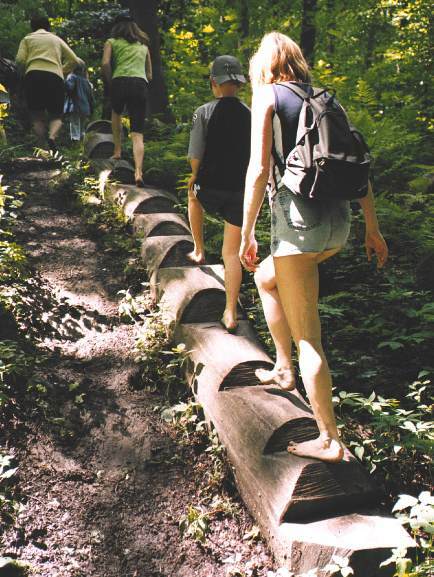 The trail with a total length of 4.5 km starts at the spa gardens and leads along and sometimes through a rivulet. Beds with various soil materials, balancing stations and water wading basins complement the longest barefoot trail in Germany. 2.7 km barefoot walk in a heath and forest area with 60 stations for feeling materials including mud and water, for various sensory experience and balancing. 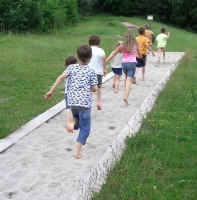 2.5 km barefoot walk with different soil materials, water wading, playground. 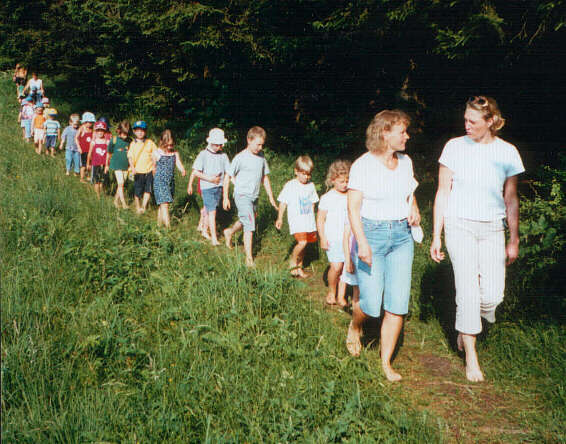 This 3.5 km barefoot walk along the river Nahe was the first one in Germany. It is equipped with sections of varying materials including a long basin of loam. 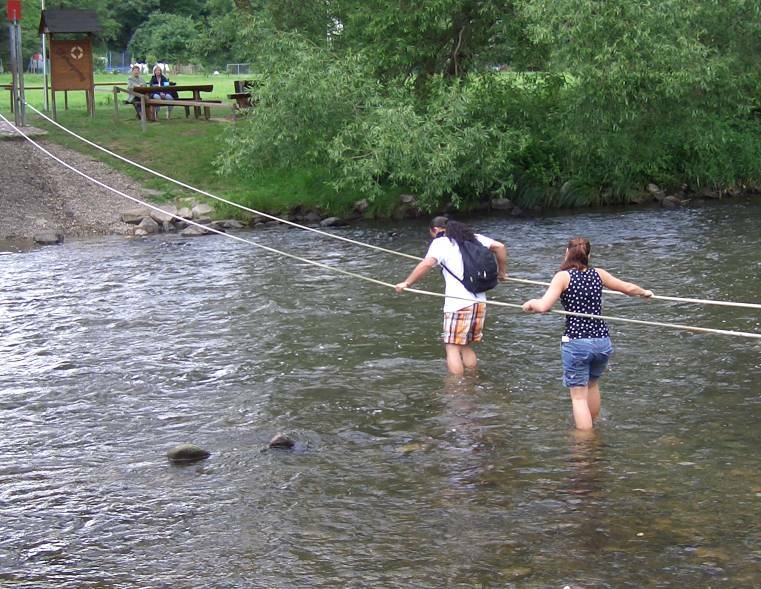 In addition there are stations for various balancing exercises and several adventurous ways to cross the river: through a ford, with a ferry boat or over a long suspension-bridge that may not be entered with shoes. 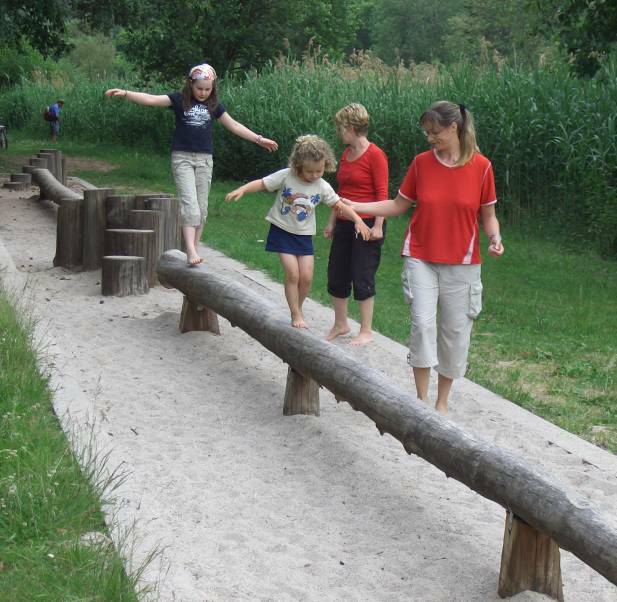 Situated 45 km west of Budapest, this barefoot park offers 21 sections with different materials including balancing poles, mud and water. 5 km barefoot hiking trail in lovely landscape, mostly over meadows with mud and water wading. Within the theme park "Trentham Estate", 1 km barefoot walk offers different soil materials including mud and water. Other attractions like a maze and playgrounds are nearby.